blog Business Tips How can PR support your SEO strategy? How can PR support your SEO strategy? More and more, small businesses and startups are focusing on SEO, and have a tendency to relegate PR to a position of secondary importance. Yet, PR and SEO can work perfectly together as they have a lot in common. Here are some tips to integrate PR in your SEO strategy. SEO and PR, what do they have in common? We can define search engine optimisation (SEO) as a set of techniques and strategies aiming at improving your website authority online and your ranking on search engines. On the other hand, public relations is aimed at maintaining and promoting a positive brand image and at communicating the companies messages to its different audiences. Although at first, it is difficult to see what SEO and PR have in common, they actually have a similar approach. They are both all about building authority and recognition around your brand. When you create your SEO strategy, you first think about the type of content you're going produce for your target audience. It generally needs to be useful and authoritative. You want the readers to see that you know what you're talking about. You also want your website to become a source of reliable and relevant content in your industry. That’s why search engines favour websites that have many backlinks coming from other relevant websites. It means your content is good enough to be recommended. In the same way, PR helps you build trust and authority through third-parties such as journalists, bloggers, influencers and even customers (online reviews). Why? Because the power of recommendation is priceless. 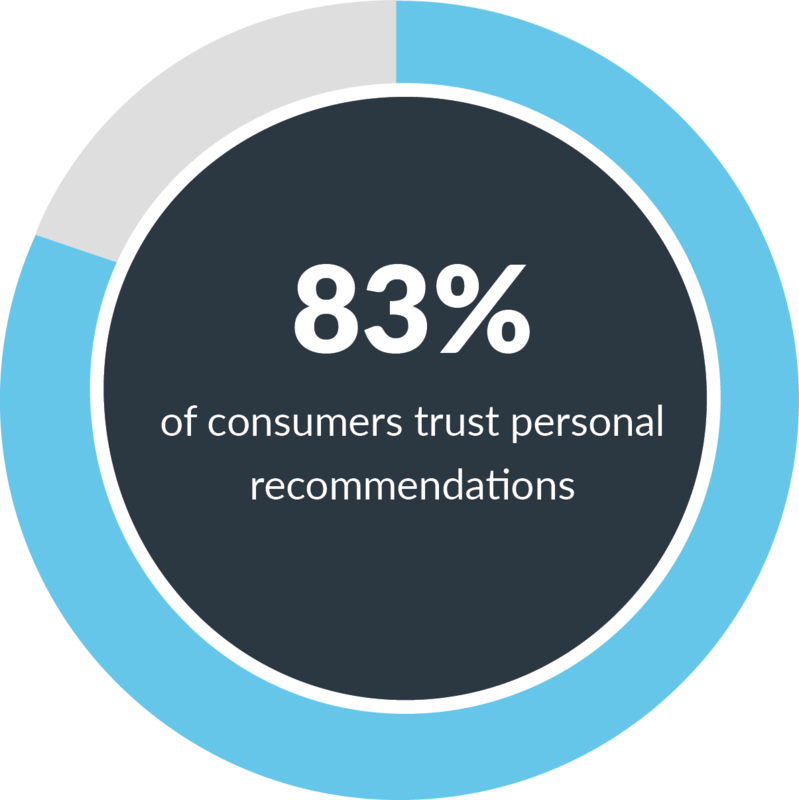 According to a Nielson study, 83% of people trust personal recommendations. Are you organising an event? Launching a new product? Operating an important change in your business? It’s time to send a press release to the media that could be interested. If your story is relevant enough, journalists and bloggers will pick it up and write an article about it. Most of the time, the journalist or the blogger will include a link towards your website. If not, you can still ask them when thanking them. This is an efficient and simple way to get backlinks, not forgetting that you also increase your brand awareness and trust. Read our guide to writing a press release if you need help with this. You can also monitor media requests using a media enquiry service or the hashtag #journorequest. Journalists are often looking for comments or case studies for their articles, so if a request is relevant to you or to your business, it's an easy way to get a backlink. PR is the art of developing relationships. Relationships with journalists, bloggers, influencers and with the news. By collaborating with the right people, you'll be able to place some content and some links on their websites and on social media. Once again, it's great for your SEO but also for your brand profile. SEO can be really difficult for companies that don't have an army of experts working on it. The competition is tough and some markets are saturated. Sometimes it's almost pointless to try to rank a page for certain keywords because your competitors are 100km ahead of you. That's where PR becomes handy. What if, instead of trying to improve the ranking of your product page, you were trying to get an authoritative website to talk about this product? Let's say that I want to buy a single speed bike. The first thing I do is to search for it on Google. As expected, most of the results I get are bike brands promoting their single speed models. But there are also some articles listing the 'best single speed bikes' published by authoritative cycling publications. At this stage I am still prospecting, so I might actually click on one of them to learn about the different options on the market instead of clicking directly on a brand website. 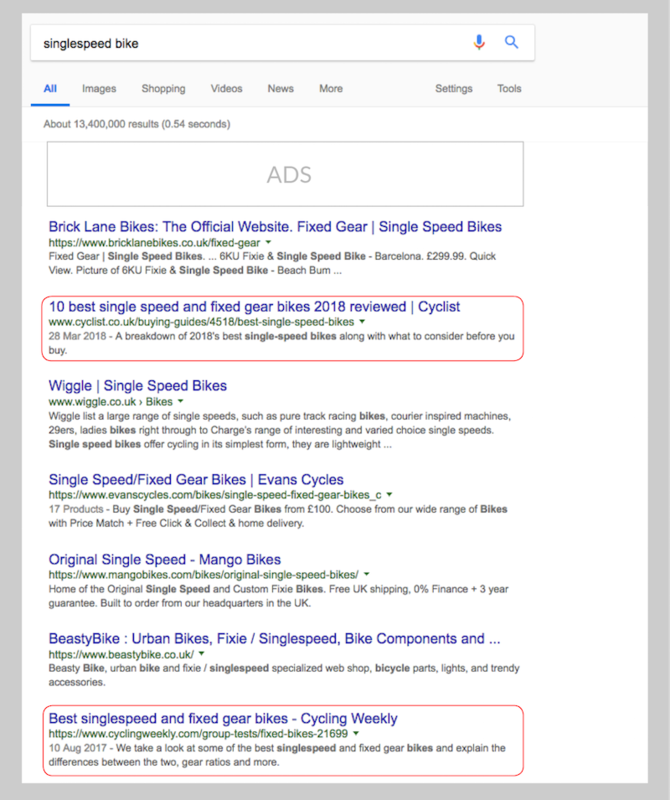 So now, if your business is selling single speed bikes, you better appear in these articles. And PR can help achieve this kind of coverage. The best way to get your brand mentioned in these types of articles is to approach the relevant journalists or bloggers directly by email or on social media. You can also look out for editorial requests from journalists. A lot of them regularly write review articles and they often need case studies. You can also look out for journalists looking for products to feature in their seasonal gift or product guides. For Christmas or Summer for instance. Feel free to read our tips on how to get your product in a magazine gift guide. Another interesting thing to note when integrating your PR and SEO strategies is the authority score of the websites you are targeting. Indeed, search engines don’t just look at the number of backlinks you've got, they also look at their quality. A link coming from a trusted website with a good authority online will have a much better impact for your SEO than many links coming from nondescript websites. Naturally, most of the time media websites have a very good authority online. So when you get a link from one of those media websites, that’s good news for your SEO. If you want a good indicator of the authority of a website, you can use moz.com. They provide a score for each website, based on many criteria’s like the traffic or the quality of the content. We've explained it, PR can be really helpful for your link building strategy but the relationship works really well the other way around too. If your business appears on the first page of Google or Bing when searching for a product or service that you offer, users will unconsciously start trusting your brand because being at the top of a search results page sends a positive signal. In a users mind, it means that your business is well established and probably used by many other people. And PR is all about what people feel about your brand. If a prospect feels confident and positive about it, you increase your chance of conversion. When building your SEO strategy, don't forget PR and vice-versa. The two disciplines are not only complementary, but also essential for your business growth. By combining them, you can be sure to increase your website traffic, to build trust and recognition and consequently to boost your sales. Remember, cognitive - what people know about your brand - and affect - how people feel about it - are both necessary to convert a prospect into a customer.